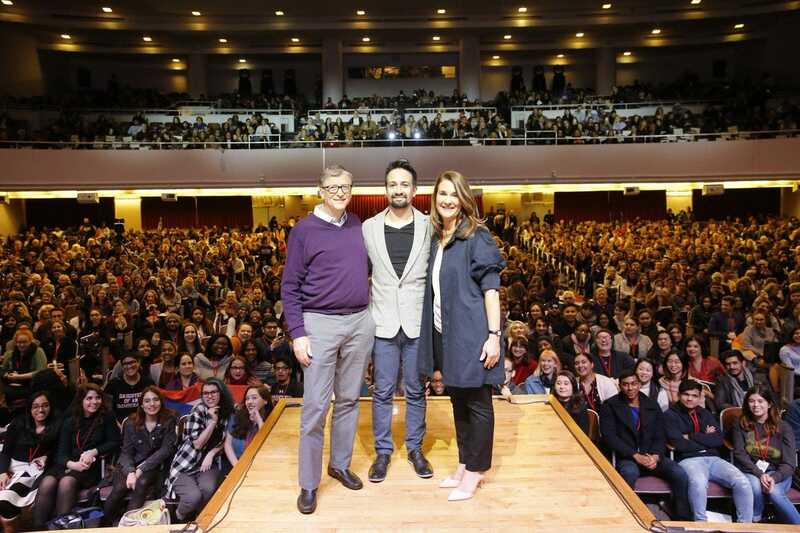 Hunter CollegeBill Gates, Lin-Manuel Miranda, and Melinda Gates at Hunter College, February 13, 2018. During a live Q&A in New York City on Tuesday, Bill Gates said that he feels optimistic that the world is getting better. There is positive data to support his claim. Gates added that although global heath is “under attack” in the Trump era, he still believes future generations will be better off than past ones. On Tuesday, Broadway composer Lin-Manuel Miranda and billionaire-philanthropist couple Bill and Melinda Gates shared a stage at Hunter College for a question and answer session. Gates replied that, by almost every objective measure, he believes the world is getting better. There is more data to support his claim that the world is improving. In 1990, more than a third of the world’s population lived in extreme poverty, but it’s now down to about one-tenth. More children than ever before (over 90%) also attend primary school today. Plus, over 100 countries have laws that protect LGBT people, and a rising number of women are running for and taking public office worldwide. Later in the event, Miranda asked how the Trump administration’s policies have affected the Bill and Melinda Gates’ Foundation’s work. They replied that, while Trump’s moves to reduce foreign aid have hindered poverty, health, security, and hunger abroad, they are confident the world will continue to make progress on these issues. Melinda Gates noted how foreign aid makes up less than 1% of the federal budget. The Trump administration’s proposed 2019 budget includes a 29% slash ($US17 billion) in spending for the State Department and the US Agency for International Development. The proposal calls for increasing military spending and maintaining foreign-aid levels for just one country, Israel. In the Gates’ 2018 letter, they wrote that Trump’s “America First worldview” worries them. Nevertheless, Gates said scientists, medics, and social nonprofits should congratulate themselves on the ways they have alleviated global suffering. “The world should be proud,” he said.